The most comprehensive mixer available, but best when used in the full setup. Time to re-mortgage. Amazing 5.8-inch multi-mode touchscreen. Live sampling with CDJ-2000. Huge choice of effects and combinations. Designed to perfectly complement the incredible CDJ-2000 decks. The multi-mode, duo touchscreen even handles wet hands. On the back are ports to connect up to four CDJs and two laptops at the same time. Fine tune what frequencies the effects are applied to. Taking this mighty mixer out of the box is quite incredible. It's a heavy, wide and very robust feeling unit with a 5.8-inch dual-touch touchscreen interface and central effects section dominating the majority of the space. It's designed to sit flush alongside the CDJ-2000s, and Pioneer has mirrored the same slanted-front design. When you're in front of four CDJ-2000s and this mixer, it not only looks awesome, but the amount of flexibility in how you choose to DJ is immense with this particular setup. Although the mixer can work splendidly with any other CDJs, its integration with the 2000 series is incredible. "Using start/stop and MIDI on/off, you can choose when to send MIDI from the mixer and when not to." Around the back there are six LAN ports, with four ports to connect CDJ-2000s using the LINK technology and two for connecting two separate laptops running Rekordbox. This means that laptops can be connected via a single LAN cable and, when using the CDJ-2000s, can act as a means of searching and browsing your music, while all the actual DJing is done on the Pioneer hardware by dragging songs directly onto the Live icons of the CDJs or even directly on to the mixer. When songs are dragged onto the DJM-2000 mixer icon, they are previewed - you can use the Link Cue function to preview tracks without having to load them to a deck. This makes browsing your laptop-stored music even faster. Of course, as mentioned before, this is only one way to DJ using this mixer. Inside the DJM-2000 there's also a 24-bit, 96kHz, eight-channel soundcard, so it's easy to hook up a laptop and use the DJM-2000 as a multi-output soundcard and mixer without any extra external boxes or audio interfaces required. The EQ is again based on the subtle Pioneer sound, with the option of switching the EQ from either a +6dB to -26dB range to an isolator setting, which will completely kill the high, mid or low frequencies when turned fully to the left. The central Effects section is based on the EFX-1000 outboard effects units from Pioneer and includes a few extras such as Reverb, Slip Roll, Gate and Multi-Tap Delay. There's also a three-band frequency isolator-style EQ, which allows you to fine-tune the effects to the frequencies you want and even add feedback loops and added resonance by pushing the three frequency bands to the max. The Slip Roll is a particular highlight of these effects, enabling DJs to cut a section of the track and loop it at fractions, just like a standard roll effect. But, with Slip Roll, you can re-trigger the fractions from new points while the track continues underneath. This makes for a much more natural beat-chop effect when in the mix. Each of these central effects can be applied to individual channels, A or B sides of the crossfader or the master channel. This isn't where the effects end, though, as Pioneer have also included six INST FX, which can be applied to each channel and controlled using the Filter Control rotaries located above each volume fader. The usual effects suspects are here including HPF, LPF, Crush, Zip and Jet, but the coolest effect is the inclusion of a noise oscillator, which can be swept onto any channel using the same channel specific Filter rotary. This makes creating your own build-ups and drops very simple, and added fun can be had by applying the main effects over the top of the noise such as adding a Phaser or Transform effect. This feature alone will make this mixer a firm favourite with club DJs. The inclusion of MIDI with this mixer is very thorough, with a dedicated MIDI Out port that can send MIDI clock to external devices dependent on the bpm calculator readouts. All controls of the unit are also MIDI-mappable. As yet, the unit has no Traktor TSI template available, but Pioneer expects templates to be forthcoming. Using Ableton, Traktor or any other MIDI software alongside the normal functions of two CDJs and a mixer is also easy. Using start/stop and MIDI on/off control buttons, you can choose when to send MIDI information from the mixer and when not to. The unit is also separated into two MIDI zones: the touchscreen and the rest of the unit. Both these zones can have separate MIDI channels, so that the touchscreen could be used to trigger clips in Ableton while the rest of the unit is set to take command of Traktor. With touch technology in its SVM-100 AV mixer, it's no surprise that Pioneer has embraced the popular world of the touchscreen in their DJ line. The DJM-2000's whopping 5.8-inch colour touchscreen is an amazing feature for a mixer to have, nonetheless. Designed as the solution to a multitude of duties, it includes a Frequency Mixer, MIDI controller and Sidechain Remix mode. The screen is duo-touch, which means only two actions can be performed at the same time, but on a screen this size it never becomes an issue. The first obvious test was to wet our fingers and test the touchscreen for issues in a recreated drunk/sweaty/clumsy club environment. We're pleased to say that it passed with flying colours and seemed just as responsive with to damp daubs as it did to our dry ones. Testing out the innovative Frequency Mixer was also a success. This multiband crossfader is split into seven different frequency bands and allows you to crossfade them between whichever two channels you like. In use, it allows you to blend frequencies between tracks more subtly than ever before - way surpassing what is possible using channel EQ tricks alone. It will certainly be hugely popular with the Techno, Minimal and Progressive crowds for incredibly smooth mixing. Another feature on the touchscreen is the equally original Remix Mode, which serves up an X/Y pad that can control one of four different oscillators, a Roll Style sampling mode, Pitch effect and Gate effect. The oscillators are all noise-based drum sounds with hi-hat sound on oscillators one, two and three, and a more 808-style snare on oscillator four. Using this mode, you quickly realise that its success is dependent on the track triggering the oscillators. The oscillators are envelope-triggered rather than triggered by the master bpm, and you can mute high, mid and low frequencies to tighten the amount of transients triggering the oscillator. While there's a fair amount of tweakability, it can sound a tad clumsy if you're not careful, but the bonus is that any tempo changes or movement in the trigger track instantly feeds back to the oscillator. Feeding these noises to a separate channel and adding a mixture of the INST FX and main effects is where the fun really begins. The colour touchscreen is the obvious main attraction on this mixer but hiding in a small button to the top left of the screen is a Live Sampler mode. For on-the-fly creative performance this is an unbelievable tool, although you do need to have a LAN-connected CDJ-2000 for it to work. Hitting the button brings up a GUI on the interface where you can record up to eight seconds of either the microphone input or the master channel output. Once sampled, hit the Link button on the CDJ-2000 deck and you can select the DJM-2000 and playback, scratch and manipulate the sample you've recorded. The possibilities for working alongside MCs and with instrument players are obvious when using this feature. Being able to loop, effect, and scratch sounds you've only just sampled is sure to be a crowd-pleaser and another creative weapon for the DJ. Plus, because the DJM-2000 has the ability to 'talk' to the CDJ-2000s in the way, the circular ring of light around the jog wheels of the CDJ-2000s will actually glow red when they are 'on air' (the mixer faders turned up), helping to stop accidents from happening when four CDJ rigs are in use. 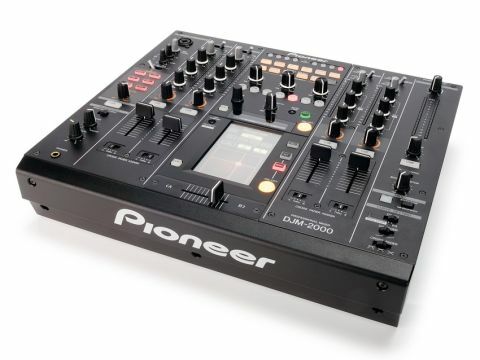 Pioneer have really gone all the way with this mixer, serving up a solution for every possible scenario and making the regular two-CDJ-and-a-mixer setup more creative than ever before. As soon as you decide on the best way the mixer works for you, it's much easier to focus on the details and colouration of your mix rather than getting bogged down in features and effects, which is very easy to do. Pioneer have stuck with familiar controls and stylings, which lowers the immediate learning curve, and added features such as Remix Mode, Frequency Mix and touchscreen MIDI templates are simple to get to grips with. You can't ignore the massive price tag here, but this is one of the most cutting-edge mixers on the market and could form the basis of everything from a creative DJ act to a full-flight Electronic music show. When combined with four CDJ-2000s, it's easily the most creative, stable and well-thought-out DJ rig available.